Tech stocks are leading the market rebound Tuesday. Apple was up 2.6% Tuesday afternoon, with Netflix,Amazon and Facebook all in the green as well. US stocks are attempting to rebound on Tuesday. As the Dow Jones industrial average seesaws between gains and losses, tech companies were slowly turning green and leading the charge to a stock market rebound. Apple was one of the best performing Dow Jones industrial average components on Monday, closing down just 2.8% compared to the index’s overall 4.59% decline – its biggest single-day per cent drop since August 2011. 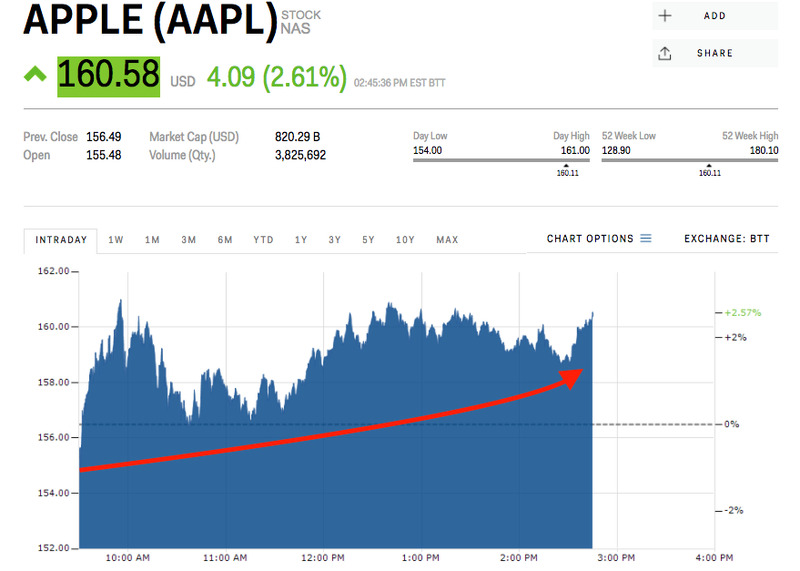 Tuesday, with the Dow sitting down roughly 100 points, or 41 basis points, Apple was one of the biggest gainers of the day, up 2.61% to $US160.58 at the time of writing. Outside of the Dow, the tech-heavy Nasdaq 100 was one of the best-performing indexes, up half a per cent Tuesday afternoon.Netflix, which reached record highs ahead of the market selloff following its stellar earnings report, was up 2.06%.Microsoft was up 0.65% at the time of writing, Amazon was up 1.66%, and Google parent Alphabet was down 0.31%. Alphabet’s disappointing earnings report on Friday seemed to be a harbinger of this week’s slump. Shares of the company lost more than 3% after the miss. Additionally, a stronger-than-expected report on wages Friday sparked worries about a return of inflation to the US. Those anxieties extended into this week as a combination of computer-driven trading, withdrawals from popular exchange-traded funds, and margin calls on investors who had bought stocks with debt all contributed to selling. At its worst on Monday, the Dow was down more than 1,500 points.